Last night, as monuments to the racial terrorists and national treasonists Jefferson Davis and Nathan Bedford Forrest came down in Memphis, my friend Brian Hamilton, managing editor of the excellent digital magazine Edge Effects, tweeted a link to a piece he published there in the wake of Charlottesville. (A brief aside: I highly recommend checking out Edge Effects and following it on social media — especially but not only for those interested in environmental issues.) 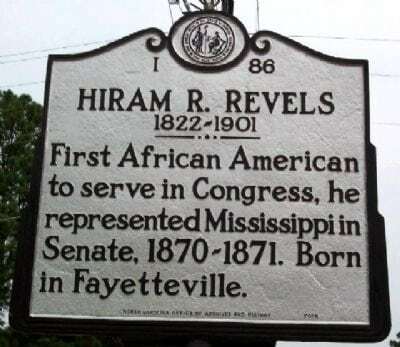 The article explores the commemoration (or lack thereof) of Hiram Revels — the first black person to serve in the U.S. Congress, who took his seat during Reconstruction as part of a larger reimagining of what American democracy could look like. The loudest argument heard from supporters of [Confederate] monuments in the past week and a half is that removing them from public view threatens to “sanitize” or erase history. Many scholars and others have, in response, lampooned the notion that we rely on marble and granite alone for our knowledge of the past. But monuments do have much to teach us. History is not written by the winners, exactly. It is written by the powerful—those rich in time and skills, and with access to capital, publishers, and public space. Books may be better vessels for teaching history, but public monuments are illustrative measures of power. By wandering through our cities and towns reading the landscape of historical commemoration, we can see who has had the power to write history. And we can learn the story the powerful sought to tell. Exploring public memory means looking for absences, too. 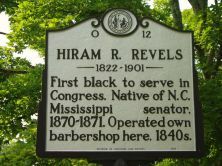 The story of Hiram Revels could have been enlisted in a commemoration of the “new birth of freedom” Lincoln heralded at Gettysburg, the “revolutionary waging of war” Karl Marx cheered from London. His story could have been celebrated as the full flowering of the 14th and 15thAmendments, which tied Union victory to racial equality before the law. For eight decades, Revels cut a swath across the nation, traversing the South and the North. Yet the places he lived barely whisper his name. One can find it only on a couple of roadside signs put up in the last 30 years and a boy’s dormitory at Alcorn State. He is a part of the public history of the Civil War that is in little danger of being erased, because it was scarcely written, or carved, in the first place. This is not a story of one forgotten American hero. Rather, his absence from the landscapes he inhabited requires us to open scores of missing person investigations. Revels would not crack most historians’ top-ten lists of important figures in the freedom struggles of the Civil War era. But he would seem to be an easy figure to have recognized in a nation accustomed to equating first with historic, politics with history. What about all the other worthy women and men who worked to give meaning to the Union victory by fighting to redefine American citizenship in the Constitution and throughout the land? Monuments to them do not exist in part because white Americans had more control of public spaces and more capital. (Yes, some monuments were cheap, but not all. Natchez imported theirs from Italy; one of Jackson’s was cast by Tiffany & Co.) In a rare instance after the war when African Americans did fund a memorial, the result, featuring an enslaved man kneeling at Lincoln’s feet, hardly conjures the spirit of freedom and political equality. That is because monuments invoking racial equality would have disrupted the parallel projects of restoring white rule in the South and reuniting white northerners and southerners. To remind those living in a time when the radical promises of the 14th and 15th Amendments had been foreclosed that a black man served in the Senate in 1870 would have suggested that white supremacy was not inevitable, that it required effort. And it did. It took time, money, laws, granite, and bloodshed. It was a political project, and it produced and enlisted the 1,500 Confederate symbols that now adorn our nation’s public spaces. Today, in the wake of Charleston and Charlottesville, a small number of those pedestals stand empty. Many have recommended explanatory plaques be added to the monuments that remain. Some have suggested contextualizing the now vacant daises, too. Others, including New Orleans Mayor Mitch Landrieu and historian Eric Foner, have called for new monuments, the public memorials to slavery and statues of people like Revels that would already be more than a century old had Jim Crow not robbed the quarries, had white northerners not retreated from the battle for the war’s legacy. Torch-wielding white nationalists, of course, insist the monuments must remain, and national polls make clear that they are not alone. White nationalists understand preserving these monuments is a political position. Charlottesville has made it harder to ignore the politics of maintaining the status quo and the morality of inertia. But one can almost feel the news cycle moving on. It would be unfortunate if the national conversation gets cut short, for we’ve seen in the last week a swell of public history commentary as large and rich as any I can remember. It has helped us to grasp that the past—with its billions of people and multitude of scales—is functionally infinite and, so, who and what we pluck from that expanse and, literally, put on a pedestal is a powerful act, reflecting values and ambitions, and shaping collective memory and political possibilities for many generations to come. This point bears repeating: advocating for the preservation of Confederate monuments in public places — under whatever guise — means taking a political position. I recommend being on the correct side of the issue, and personally hope that for every Davis and Forrest monument that comes down, three go up for people like Revels.